Wood covered with satin, worked with silk and metal thread with raised work, also known as stumpwork. Worked in split and satin stitches with French knots, buttonholing, darned silk pile and laid and couched work. Sewing was an important skill for a woman in the 17th century and was taught to girls of all classes from an early age. Plain sewing - hemming and seaming - was of particular value for the production of underclothes and basic household linens. Only a privileged few, however, were able to afford the time and materials for embroidery. There appear to have been a number of accepted markers in the development of a competent needlewoman. First a band sampler was completed, illustrating the range of stitches and techniques that the girl had mastered. Then these skills were developed by sewing a more complex and demanding cut-work sampler. 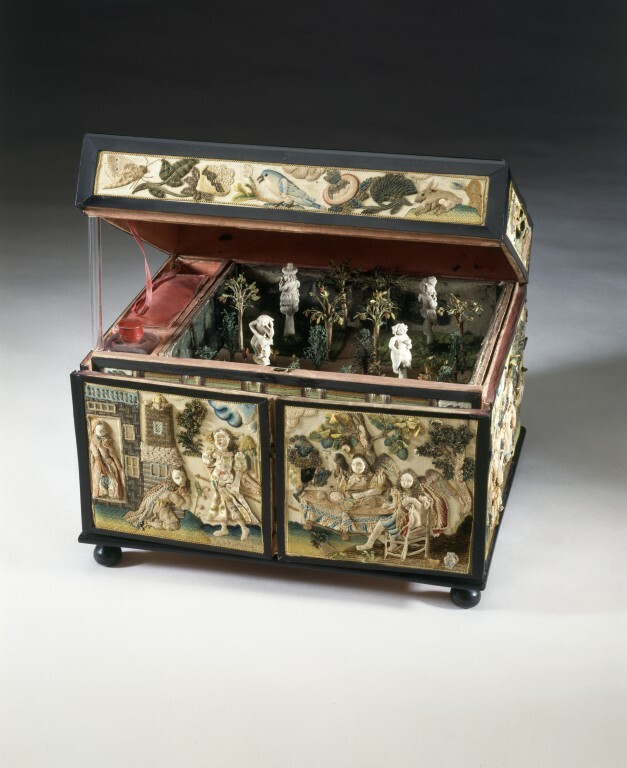 In many cases the final challenge was the production of a casket like this one, depicting scenes from myth or the Bible using a wide range of stitches and materials. In particular these caskets employ raised work, the technique of embroidering over padding. It is probable that each individual figure or element was sewn independently and then applied to the delicate white satin background. This meant that the needlewoman could experiment and correct mistakes which would be impossible to rework on the satin. Once the panels were completed they were sent to a local cabinet-maker who mounted them on wood and made them up into a casket. The silver braid conceals the joins and prevents the satin from fraying. 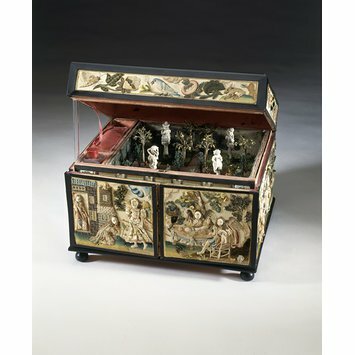 Different scenes, almost certainly derived from contemporary prints, adorn each of the five visible surfaces of the casket. Satin panels worked with silk thread. Raised work, metal thread, mica and glass beads are also used in decoration. The panels are edged with wood and the casket has spherical wooden feet. On the lid, there is a cartouche showing Issac meeting Rebekah. The initials S.V are embroidered above the sun and clouds. Around the edge of the lid are small motifs including poppies, pomegranates, sunflowers, parrots and butterflies. The front doors show Abraham entertaining the Angels. The left side of the casket depicts Eliezer giving betrothal gifts to Rebekah, and the right show Eliezer taking leave of Abraham. On the back there is a central scene of Abraham with Hagar and Ishmael and to their right is Sarah and Issac in a tent and to their left an angel appears to Hagar in the wilderness. The interior is also decorated with embroidery, the drawer fronts have geometric flowers in laid work. The inside of the top compartment is decorated with a 3D miniature garden with flour plots, fruit trees and ivory figures. The interior and exterior panels are edged with wood. The casket is comprised of two key segments, the top segment is revealed by opening the lid. The interior is split into two segments with the garden taking up the majority of space. The garden can lift out. The second segment is revealed by opening the doors, this reveals drawers. Nevinson, J., Catalogue of Domestic English Embroidery of the Sixteenth & Seventeenth Centuries (London,1950).